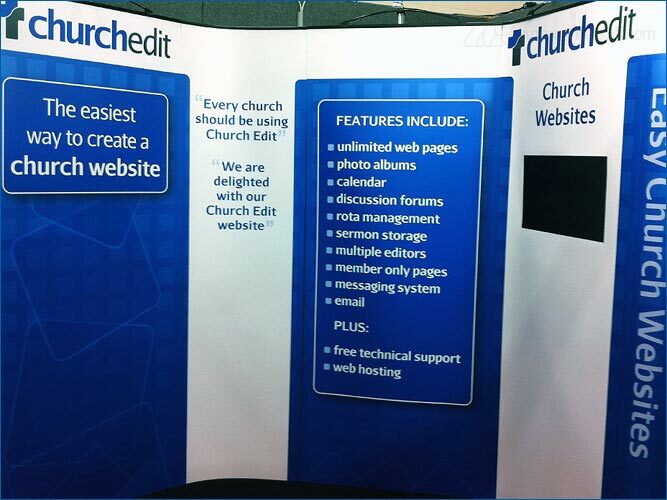 I recently designed a Large Format Exhibition Stand (display) for ChurchEdit, a company I have written about before regarding their logo design process. 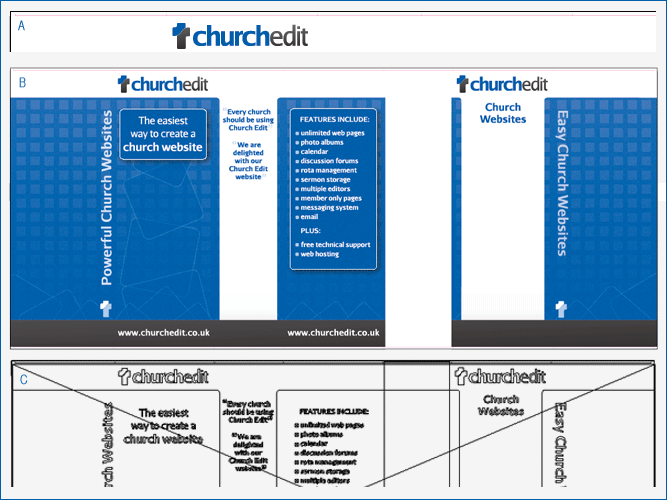 The Image above shows the file for the design. A shows a closeup of the top edge of the file. Unlike a standard setup for say, a letterhead, the printer only required some marker guides coloured in magenta. This is because the design is cut-out by a person with a guillotine after being printed via large-format inkjet. In all, the design was split into six panels. B shows the actual design that I compiled in Adobe Illustrator. All logos and texts were in vector, with the whole background image originally designed in illustrator, then rasterised and tweaked in Photoshop before being placed back into an illustrator file. C shows the outlines of the vector and bitmap elements. 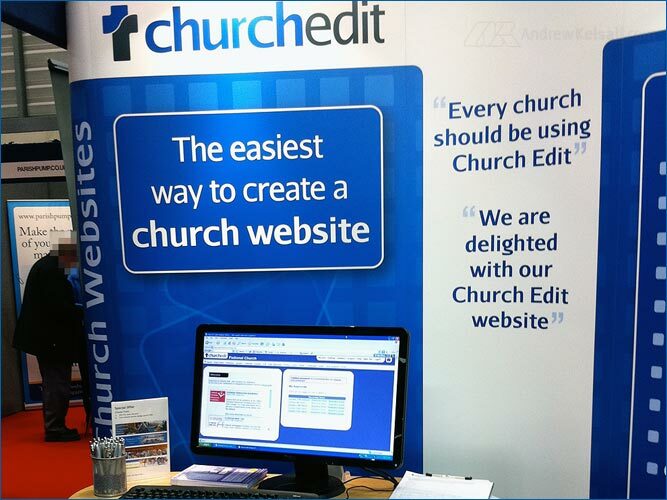 This image above is both the Churchedit logo and accompanying icons I designed for the Christian based service, Edit Websites. The image above is a photo taken by Kyle Cottington, the man behind the company. It shows how the exhibition display stand incorporates an LCD screen (on the top-right). The whole display is made of six sections which interconnect. They’re also interchangeable, so sections can be either omitted to save space, or rearranged for varied configurations. This is another shot of the left-hand side of the display. As can be seen in the above image, the outer edge wraps around at the side (on both ends). If you take another look at the file setup image (B), you’ll notice how the design extends around the back. Overall, this was a great project to work on. I’ve done plenty of large format works before, but never a display like this one (although the principle is the same). I had some issues getting the colour blue right on the proofs, although colour matching isn’t a strong-point with large-format inkjets.